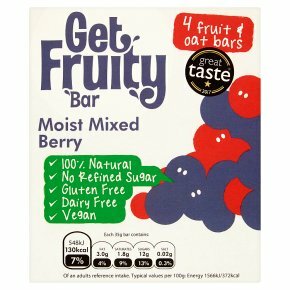 Berry fruit bar made from a blend of real fruit including juice infused cranberries, blackcurrants, blackberry juice and concentrate & British wholegrain gluten free oats. Great taste 2017. 100% natural. No refined sugar. Sugars only from fruit. Gluten and dairy free. Low in salt. Source of fibre. Vegan.The Award winning great tasting Get Fruity bar; made of real fruit, fruit juices with gluten free wholegrain oats baked to perfection with absolutely no artificial bits!! No added Cane sugar, the only sugar in our bars occurs naturally from fruit and fruit juice concentrate. Vegan and dairy free. No artificial ingredients. Gluten free. Low in salt. Good source of Fibre. Moist blackcurrants give our mixed berry bar an intensely tantalising flavour, and a longer lasting fruit taste. Our cranberries are juice infused to balance their distinctive zingy taste. They have a perfect blend of tart and sweet flavour. Luscious blackberry juice is added to our bar to complete the rich berry flavour, a perfect balance of ripe fruit. At Get Fruity we bake all the bars ourselves on our nut free site, here in Cornwall. This gives each bar the time, care and attention it deserves. Our bars are made using simple premium ingredients making them the perfect healthy snack for all the family. A ?wholesome' treat for all the family that is so fruity and mouth-wateringly juicy you won't be able to leave them alone. We are confident that all our ingredients are naturally good for you, and taste amazing with only 130kcal per serving; a snack bar that really does have it all!